Navigating a sea of engagement ring choices can be tough, so read through these simple steps when considering which ring will suit best. There are thousands of engagement rings to choose from. Bear in mind your will be worn for a lifetime so it’s worth taking the time to choose the right one. Couples should not be pressured into a purchase. Instead, they should shop around and be sure to buy from a reputable company. Now that the ring has been selected, the next step is popping the question. Marriage proposal can be a daunting experience, so it helps to know the rules of ring-giving. The tradition of giving diamond engagement rings began in 1477. Archduke Maximillian of Austria gave Mary of Burgundy a gold ring set with a diamond as a token of his love. This royal tradition has lived on over the centuries. The giving of a diamond ring has become as much of a milestone as the engagement itself. Today, most brides-to-be receive diamond engagement rings. Traditionally, the man pays for the ring and one popular guideline is that it should cost him a month’s salary. It should be left to the individual to decide the budget. It’s best to steer clear of second-hand rings, unless they are quality antiques or family heirlooms. Even then one should be careful. The groom-to-be should never give a girl a ring he already gave to someone else either. Men planning a surprise can be sneaky and check their girlfriend’s ring size by borrowing one of her other rings. Don’t forget to replace it before she notices it’s missing. To gauge what style she likes, boyfriends can look-out for styles she likes on her friends, in advertisements and in jewellers’ windows. Does she prefer traditional or modern jewellery? Does she wear yellow, white gold or platinum jewellery? After the purchase, always keep the receipt. If she doesn’t like it, says no or if an insurance claim is needed, then the receipt is essential. Insure the ring as soon as possible, just in case. And, if one plans to pop the question abroad, they should make sure it’s covered by travel insurance. A great idea is to buy a cheap silver ring with which to propose and then let the bride to be choose her own ring (the man must make sure she realises this or he may not be popular!). Or to be really unique and very romantic, the couple could design the ring themselves, with a trained jewellery consultant. Diamonds are traditionally the most popular stone for engagement rings. This is because the diamond’s rarity and durability symbolises the constancy of the love declared by the couple. Sapphires come a close second, followed by rubies and emeralds. When selecting a diamond, consider the 4 Cs – carat, clarity, colour and cut. The combination of these characteristics determines the value, rarity and beauty of a diamond. For more information on the 4Cs, click here: Buying a diamond. Think about the shape of the diamond. The most traditional is round brilliant, but there are many others including pear, emerald, oval, heart, marquise and princess. For more information on diamond shape, click here: which diamond shape? The most popular engagement rings are diamond solitaires, followed by clusters, and the increasingly fashionable, three stone ring. The bride-to-be should have her ring size measured properly. This can be done in any jewellery store. The ring shouldn’t fit too tightly – in hot weather hands swell up and the wearer won’t be able to get it on or off. Equally, it shouldn’t be so loose that it slides around on the finger or over the knuckle too easily. Couples should consider the type of wedding ring they’d like to wear, so that both the engagement and wedding rings will go together. Usually wedding rings are gold, white gold, rose gold or platinum. The engagement ring generally looks better made from the same metal. Consider the quality of the metal used in the construction of the engagement ring. Most engagement rings are made in either gold or platinum. The Gold can be 18-carat, 14-carat or 9-carat and be either white, yellow and/or rose gold. 18-carat gold, whether it is white, yellow or rose, is the best and preferred choice for gold engagement rings. The couple can also choose platinum for their engagement ring, although platinum is significantly more expensive than gold. Choosing an engagement ring design is simply a matter of personal preference. However, there are some pitfalls in certain designs. Remember that an engagement ring has to do four things: It has to be easy and practical to wear, it has to withstand everyday wear, it has to hold its gemstones securely and it has to look good. If an engagement ring lacks any of these properties it is not of good design and is not the ring to choose. What is easy and practical depends on the wearer’s lifestyle. The higher the setting of the diamond or gemstone in the engagement ring, the more often it will catch on things. If the wearer works behind a desk, they may be able to wear a very high set ring. If they are a preschool teacher, for example, they would have to wear a safe ring that won’t get caught. The engagement ring must withstand constant every day wear. Some environments are more destructive to engagement rings and jewellery than others. For example, a work area near a factory that uses abrasives is bad news for jewellery. Surprisingly, one of the worst places for jewellery is an office where lots of paper is used. Paper is mildly abrasive, and constant daily exposure to that type of environment will wear the jewellery over the years. If one is in an environment where their engagement ring is likely to wear, a heavier style will last longer, and cause less worry. However, “heavy” doesn’t necessarily have to mean wider, it just means a sturdy, strong shank/band should be used. 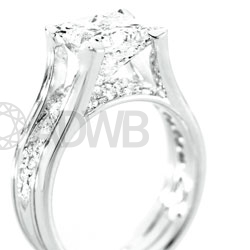 If one prefers finer, more delicate styles, they can consider platinum, as platinum will out-wear gold many times over. Discuss your perfect ring with our reputable gemologist.